About Hill-fort - Hill-fort Ltd.
Hill-fort was founded in 1997 by Mark Ashman RFS Dip Arb, M. Arbor. A. and Fleur Ketley NC Hort, RHS Gen, RHS Adv. The business specialises in two distinct but related areas of service; Tree care including Arboricultural Consultancy and Contracting and Landscaping including garden design and contract landscaping. We combine expertise and professionalism to provide a dependable, fair and honest service. Hill-fort is located adjacent to the Iron Age Hill-fort at Burrough Hill, High Leicestershire, from which we take our name. We serve clients throughout Leicestershire, Rutland and its neighboring Counties. Our clients include, City, County, Town and Parish Councils, small and large Estates, Businesses and Homeowners throughout the east midlands. Mark was drawn to arboriculture initially by the love of trees, the outdoor life and the physical challenges of a climbing arborist. He is now the manager responsible for a team of arborists and for providing expert arboricultural advice. 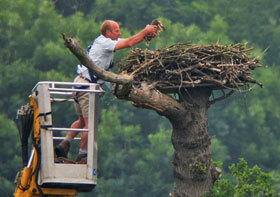 He still enjoys time spent ‘on the tools’ and in the tree, and volunteer works on Rutland nature reserve. The role of responsible manager and arboricultural consultant requires continuous professional development. Mark is a regular attendee of seminars and conferences and is currently in the process of attaining Chartered Arboriculturist status through the Institute of Chartered Foresters.